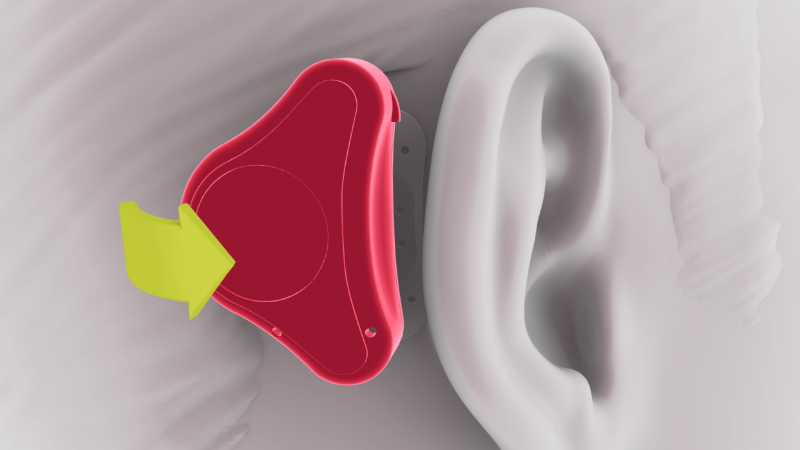 Want to maximize comfort and hearing performance for your patients with conductive hearing loss? 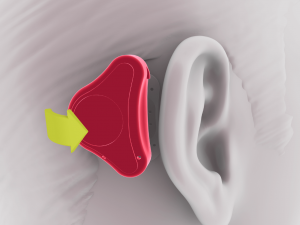 ADHEAR is our revolutionary non-surgical solution for both temporary and chronic conductive hearing loss. Today, we’re going through our top tips for getting the best performance from ADHEAR for your patients. If you haven’t seen our ADHEAR overview yet, get started here! 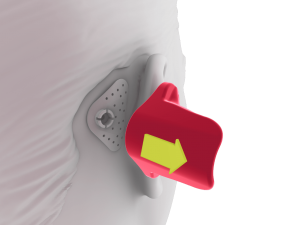 ADHEAR uses a unique adhesive design, so handling is a bit different than traditional softband or hardband bone conduction systems. Don’t worry—with these helpful tips, you’ll soon be an ADHEAR expert. ADHEAR connects to the skin using an adhesive adapter. 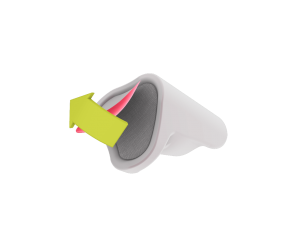 This provides a comfortable, pressure-free pathway for bone conduction. 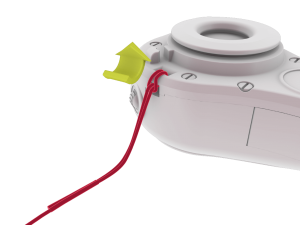 Each single-use adhesive adapter can be worn for up to 3–7 days. They’re water-compatible, so the adhesive adapter can be worn while showering, bathing, or swimming. To maximize wearing time, it’s important to make sure the ADHEAR adhesive adapter is applied correctly. 1. Wash your hands to remove any dirt or oil. 2. 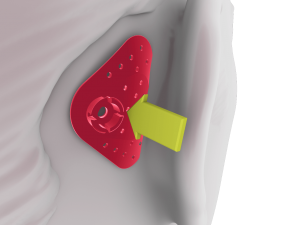 The area behind the ear where the adhesive adapter will be applied must be hairless. In case the naturally hairless area behind the ear is too small, it should be shaved. 3. Dab the skin behind the ear with a skin-friendly alcohol wipe or mild soap to remove sweat and oil. 4. Wait a few minutes to make sure that the skin where the adhesive adapter is to be applied is completely dry. Only apply the adhesive adapter on healthy skin. 1. Place the adhesive adapter loosely in the positioning tool cavity. Remove the protective film. Do not touch the adhesive surface. 2. Move the hair away from the application area, find the correct position where the tool is lightly touching the ear and then press down firmly. The adhesive adapter must be placed over bone. 3. Remove the positioning tool. Press down firmly the entire adhesive adapter with your fingers. 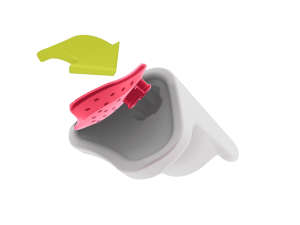 To achieve an optimal attachment, the adhesive adapter should be pressed onto the skin for at least 30 seconds. For optimal adhesion, wait for 15–20 minutes before connecting the audio processor. 4. Each adhesive adapter can usually be worn day and night for up to 3– 7 days before it should be replaced. Remove the adhesive adapter by slowly peeling it off the skin. *Please note that the adhesive adapter is for single-use only and the adhesive cannot be removed and reused after it has been attached. 1. Find the coupling position. This is where the inner edge of the coupling plate of the audio processor touches the snap connector of the adhesive adapter. The taller side of the processor should be facing forward towards the ear. 2. 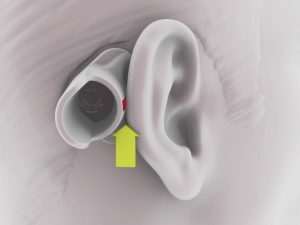 Press the audio processor down onto the snap connector of the adhesive adapter, while tilting the audio processor from behind towards the pinna in a rolling motion. 3. The final position of the audio processor can be adapted by gently rotating the audio processor. 4. 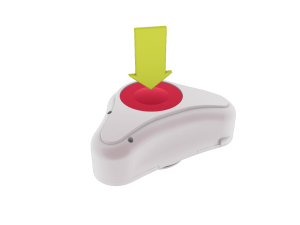 To learn this process while being able to see their ADHEAR, patients can place an adhesive on the back of their hand or other solid surface and practice snapping the processor on & off. *For optimal performance the audio processor should rest freely and not touch the pinna, glasses, headwear, or clothing. 1. 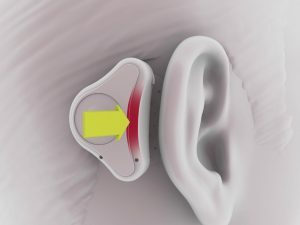 To disconnect the ADHEAR audio processor from the adhesive adapter, press the audio processor down at the end closest to the ear. 2. Do not pull in any direction or press down the rear as this may dislodge the adhesive adapter from the skin. Find the best position for each patient. The position on the skull should fit the curvature of the adapter well, maximizing the adhesive surface without any hair underneath. 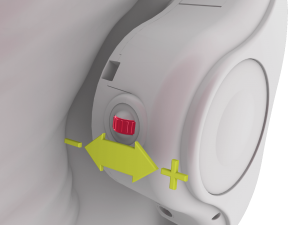 Press down for at least 30 seconds when applying an adhesive adapter to help ensure an effective adhesive connection to the skin. If possible, allow the adhesive adapter to stick to the skin for 15–20 minutes before attaching the audio processor. Avoid any pulling forces on the adapter: Any pulling forces will decrease the lifetime of that single-use adapter. 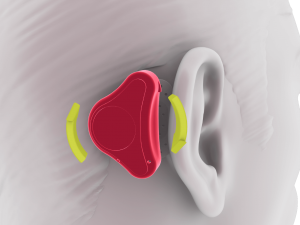 Have your patients practice the correct attachment and detachment of the audio processor on the adapter. ADHEAR uses a single size 13 zinc-air battery (also known as a PR48 battery). Battery lifetime is usually one to two weeks depending on usage. 1. To change the battery, first remove the empty battery. Pro tip: The included MED-EL cleaning brush has a magnetic tip that makes it easy to remove the battery. 2. Activate a new battery by removing the plastic tab. For best results, peel the tab off the battery 1–2 minutes before inserting it. This exposes the battery to air and lets the zinc-air battery charge up more completely. 3. Insert the new battery into the battery compartment with the + sign facing outward. 4. 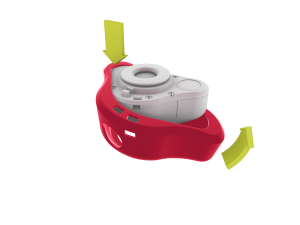 After closing the battery compartment, there is a start-up delay of a few seconds followed by an alert tone to show that the device is ready to use. ADHEAR has 4 pre-configured programs and volume control that can easily be adjusted on the processor. To change the program, simply press the program button on the processor. ADHEAR always starts up in program 1 when it is switched on. 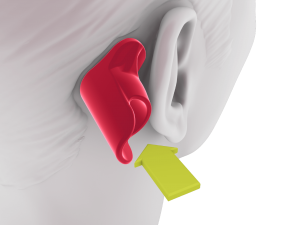 ADHEAR has a built-in volume control. Simply scroll the volume wheel away from the skin to increase the volume. Scroll towards the skin to decrease the volume. Changes in volume are indicated by a beep. You can connect ADHEAR to a retention clip with a loop. This clip can be attached to clothing. A retention clip is recommended during physical exercise, sports, play and in other situations when there may be a risk of the device falling off. 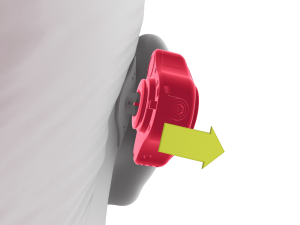 The ADHEAR sleeve offers additional protection, particularly for younger users. It is simply pulled over the audio processor. You can clean the outside of the ADHEAR audio processor with soft baby wipes. Do not clean ADHEAR in or under water. The metal coupling plate should be cleaned weekly with the cleaning brush provided to remove dirt from inside the circular coupling plate groove. The gap between the housing and the coupling plate should also be cleaned with the cleaning brush. When not in use, ADHEAR should be kept in the case provided. You can remove the battery from the audio processor to extend battery life. You should always remove the battery if you do not use the audio processor for a longer period of time to avoid battery leakage and possible damage to the audio processor. Store the adhesive adapters in a dry place at room temperature. If your patients live in a humid climate or perspire heavily, the audio processor should be placed in a drying container (available separately) instead of in the case when it is not being worn. ADHEAR has a 3-pin to 3.5mm standard headphone jack audio adapter cable that can be connected to different external devices, such as mobile phones & tablets, FM systems, and wireless receivers. 1. Connect the audio input cable to the external device and the audio processor. Make sure that the dots on the cable and on the bottom side of the audio processor align. 2. Press the program button to put ADHEAR in program 3 for a balance of external audio input and ADHEAR microphones. To hear only external audio, switch to program 4. Have a question about ADHEAR for your clinic or practice? Let us know in the comments below! Want to know how to offer ADHEAR in your clinic or practice? Contact your local MED-EL representative or use our simple contact form! Don’t miss any updates—subscribe now to get the latest articles from the MED-EL Professionals Blog.